Week Three in the NFL featured even more commissioner shenanigans, more on the field injuries and a couple of quarterbacks finding their inner wide receiver. Some touted rookie Quarterbacks finally got their start in the league, but it was an ugly week for football of all years experience. Three times in one day football fans got to watch quarterbacks turn into receivers. Andy Dalton, Russell Wilson and Johnny Manziel all showed off their receiver prowess, but for most of the catches it really exploited the abysmal defenses they were against. Dalton’s was the most dramatic, snatching the catch away from a possible interception, while Manziel’s had the most college football feel to it, but it was whistled away due to an unrelated penalty. But in a second look, that play wouldn’t have stood anyways, so until next time Mr. Johnny Football. The only points scored in the Oakland Raiders-New England Patriots game was done by guys with the last name of -kowski. Sebastian Janikowski had three field goals for the Raiders, while the Patriots had three FG’s by Stephen Gostkowski. Followed up by a touchdown by Rob Gronkowski. You can make your sausage and “how many Poles” jokes, but the Polish Powerhouses are the next evolution in dominating sports! The Howard Stern show sent Benjy Bronk to crash the Roger Goodell “Let’s do this press conference at 3pm on a Friday and hope no one is paying attention” shindig. While Goodell did the verbal version of hand wringing while saying absolutely nothing in regards to the recent scandals off the field, Bronk stole the show when he erupted into the room. While he was being taken away, Bronk pleaded to not be put in an elevator, to give the league one extra kick in the groin on the way out. And how did the commissioner of the NFL respond to the outbreak? “I promise I had nothing to do with that.” Finger on the pulse, Rog. Finger on the pulse. Until the Atlanta Falcons coaching staff decided enough is enough, it looked as though the Bucs were going to let the Falcons put up triple digits on the scoreboard. Truthfully there were a number of wacky sad moments in the fumble department of the game, but the Bucs only managed 217 total offensive yards. As predicted last week, we said this was going to be a bad game, but it became nigh unwatchable. Thursday Night Football! David Carr got the nod for the Oakland Raiders, who actually held their own against the Patriots in a Raiders kind of way. Carr went 21 for 34, but only got 174 yards and one INT because the Raiders have a bag of warm sandwiches instead of receivers these days. Fun fact: every point scored in this game was done by someone with a -kowski last name! Due to the injury that Matt Cassel went down with, Minnesota Vikings rookie quarterback Teddy Bridgewater finally got a go on a team in the running for being one of the biggest scandal makers in the league. Bridgewater had 6 runs for 27 yards, 12 for 20 in passing for 150 yards and was sacked twice. Bridgewater looked the best in the rookie class this week, but still was rushed around by the Saints offense. Jacksonville Jaguars got the most anticipated quarterback in the draft in Blake Bortles, but squandered any news of his starting when they promised to give Chad Henne the job. That job lasted the first half of the game against the Indianapolis Colts as they took apart the Jags like a cheap 100 piece puzzle. He could have just stood still and Bortles would have looked better than Henne, but throwing 14 for 24 for 2 TD and 2 INT’s showed at least Bortles gave some kind of life to the winless Jags. Offering a blood sacrifice to whatever Public Relations gods NFL owners have been praying to this week, Snyder probably thought he got some heat off of his back this season. Off-season troubles have eaten up the pages of blogs, so the controversy of the Washington Football Clubs name has seemingly dropped to a symptom of a problem and not the problem itself. 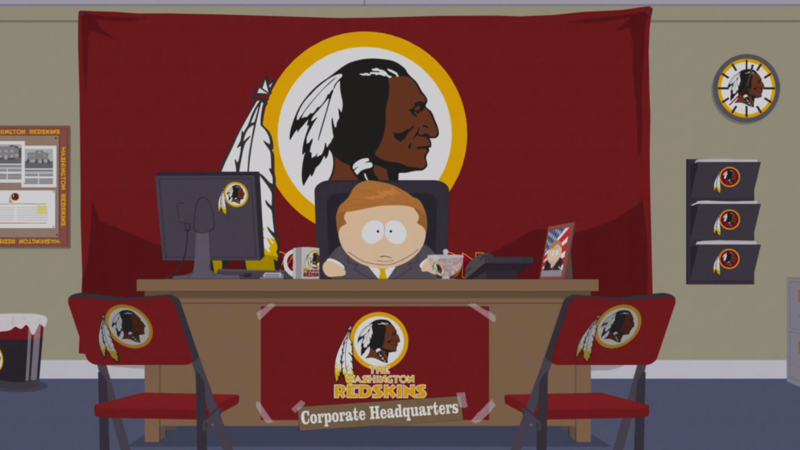 That is until the Washington vs Philadelphia game where the creators at South Park decided to unleash a promo of an upcoming episode going after Snyder. Although the South Park machine going after an issues usually means it’s limelight is over, the stretch of the controversy is now getting into the non-sports world, which will only increase the attention Snyder so desperately wants to escape. This time it wasn’t entirely my fault. My opponent’s team had Matt Ryan, who put up 23.64 points by Friday morning. A deficit I was unlikely to surpass even with all cylinders going. Couple that with my offensive powerhouse Lesean McCoy being knocked out of the game briefly with what looked like a concussion and only giving me 2.20 points. I finally started Cam Newton for the game and he eclipsed the rest of the team with 12.70 points where no one else got more than 8 points. I also had to cut fan favorite Dennis Pitta who went down hard with a non-contact injury. Hopefully Week Four is not the bloodbath of injuries Week Three turned out to be, but physical games such as Green Bay at Chicago and Carolina at Baltimore will prove otherwise. The Panthers-Ravens game is a Steve Smith revenge game, so at the very least it will be worth watching for post-touchdown passive aggressive celebrations. We also get New England at Kansas City for Monday Night, where the over-paid quarterback Thing 1 and Thing 2 can come together in harmony. What to skip: Tennessee at Indianapolis, the Colts finally got their motor last week, and will probably look to treat the Titans like asphalt. Same with Jacksonville at San Diego and Atlanta at Minnesota.